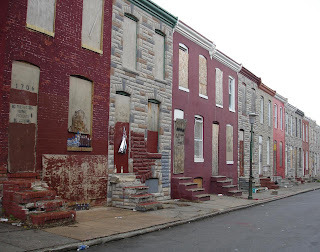 Baltimore has a few curious ghettos. In Buffalo, Detroit, and Chicago, the truly run-down neighborhoods are mostly bulldozed, so that it seems like there are a few random houses placed in otherwise empty blocks. Here, unoccupied houses were boarded up and preserved for the future. Optimistic signs listed some addresses for sale and for rent. There are many blocks like this in the surrounding area. Google Street View dared to take a look down some of these streets.